I like learning about naturopathy and the holistic lifestyle, so when I saw this title I knew I wanted to read it. Just the Essentials is the perfect starter book for those who want to learn more about essential oils. I like learning about naturopathy and the holistic lifestyle, so when I saw this title I knew I wanted to read it. I don't know as much about essential oils as I would like to. I have been reading some articles on it but I wanted to know more. So not only did this book come at the right time but it was also just the kind of book I wanted to read. Just the Essentials is divided into two parts. Part I: The 101 is a crash course on why essential oils are so great (because of the healing power of plants), how essential oils have been used in history (which I found quite interesting), and the business of essential oils (how the industry is using them) which was even more interesting and eye-opening. The second part of the book is all about how to benefit from essential oils. It starts with an explanation of the nitty gritty of essential oils or its components, so it's a quick science lesson that helped me understand how the properties in essential oils make them so good for us. For example, which oils are antioxidant and/or anti-inflammatory. Then the author explains how you can use essential oils and provides DIY recipes for skincare products, perfume, household cleaners and others. I learned so much reading this book! The author's tone is friendly (as more and more non-fiction books are today) and she includes safety precautions and what not to do. This book is packed with useful info such as the different types of diffusers and how to choose one for your needs, the beginner's top ten essential oils and easy recipes on how to use them, a section on FAQ and a handy index. I felt the author was very knowledgeable on the topic. She is the founder of S.W Basics, a skincare company that uses natural ingredients that are certified organic, fair trade, or sourced from family farms. I have used tea tree oil in the past and I also found sweet orange, sunflower and lavender oil in my cabinet, but now am determined to expand my little collection and make use of essential oils. If you have skin sensitivities and cannot use commercial products, this book will give you hope and help you make your own. The recipes are easy. You just need to get the ingredients. I made the Quick Tea Tree Mouthwash in 5 minutes and used it. It's less expensive than the commercial brands and a lot safer and doesn't leave a burning sensation in your mouth like most mouthwash. 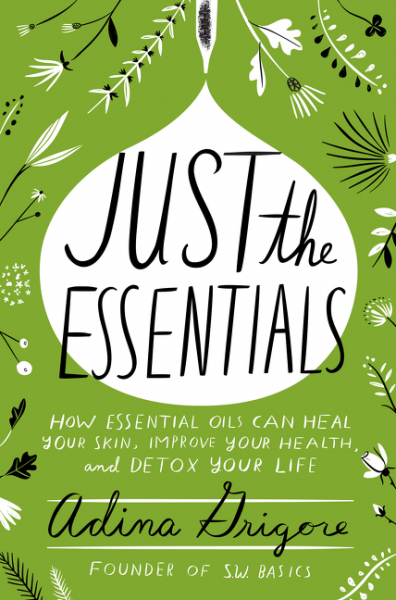 Just the Essentials is the perfect starter book for those who want to learn more about essential oils. It's easy to read and the author's own story about how she started on her journey to explore essential oils is motivating and will be revelatory for many on how you can break free from toxic skincare and other personal products. To read more reviews, please visit Adina Grigore's page on TLC Book Tours. Adina Grigore is the founder and CEO of the all-natural, sustainable skin-care line S.W. Basics, which she started out of her kitchen in 2011. 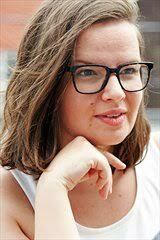 A graduate of the Institute for Integrative Nutrition, Adina has worked in the wellness industry since 2007 as a private holistic nutritionist, a personal trainer, and a workshop coordinator teaching people about the DIY nature of wellness. S.W. Basics products are now sold internationally and have been featured in Vogue, O Magazine, W Magazine, the New York Times, InStyle, Real Simple, and Martha Stewart Living, among others. I've recently become interested in essential oils so this book really caught my attention. Going to see if my library has it and if it doesn't I'll submit a purchase suggestion. That's a great idea! It would make a great addition to the library. Interesting! I didn't realize you could make things like your own mouth wash. Also, my son is getting leg cramps (growing pains) and I read somewhere that some people use oils to help with that, which I like the idea of more than aspirin.